With the Rose Bowl coming up (featuring the Oregon Ducks), here is a look at the team that changed college football uniform design forever by guest poster, Tyler. If you are interested in writing a guest post about whatever sports design topic is on your mind, send me an email at steven@thesportsdesignblog.com. At the beginning of the 2011 season, over half of the 120 Football Bowl Subdivision (FBS) teams introduced a change to their uniforms. Many of those changes—think Maryland, Oklahoma State, Arizona State, and USF—were modeled after the Nike-sponsored fashion show at the University of Oregon. Because many attribute Oregon’s status as BCS royalty to the program’s revolving door policy on football uniforms (Grantland supported this theory in a 2011 preseason post); the slew of multi-colored knockoffs from other schools isn’t surprising. To commemorate U of O’s frontrunner status, and prepare for their upcoming faceoff against Wisconsin in the Rose Bowl, let’s review how the trendsetting Ducks rode their silver wings, alien helmets, and neon greens to the forefront of NCAA Football. The University of Oregon’s genesis begins with their trips to the 1995 Rose Bowl and ’96 Cotton Bowl. Prior to those contests, they literally spent 100 years (U of O football was born in 1894) losing games. Although the Ducks lost both Bowl trips, the exposure was enough to convince Oregon alum and Nike founder Phil Knight to get involved with the program. Determined to lure better players to Eugene, Knight asked his designers how they could help the University of Oregon attract better students and better student-athletes. The answer to that question splits into two parts. The first, and more direct reply, involved the indoor practice facility and over $300 million spent on a high-tech locker room and stadium additions. The second, which the designers were responsible for, was rebranding. Nike understood that they were competing for the attention of 18-year-old jocks and kids that watch athletes on TV and then go out and buy their jersey and shoes. With that in mind, Nike turned the University of Oregon into their test lab and turf-covered catwalk. New designs and ideas filtered through Oregon before hitting the shelves, and, according to Nike creative director Todd Van Horne, “Nothing [was] off the table” when it came to generating new concepts. 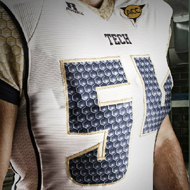 Thus, the standard collegiate numbers morphed from clunky blocks to sleek fonts and neon piping. New helmet designs were unveiled, the glove-palm salute was introduced, and gimmicks like silver shoes, wings, and diamond-patterns sprang up. This season, the Oregon Ducks wore a different uniform combination to every game, but the rapid changes didn’t start until about 1998 under head coach Mike Bellotti. Since that time, Oregon uniforms have undergone nearly one hundred iterations. The word “Oregon” bounced from pants to shoulder pads and then disappeared completely. The school debuted all-yellow unis, a yellow sabre-stripe on green pants, the yellow “O,” and fluorescent yellow numbers on a black backdrop. The 2007 Ducks opted for a subdued palette of white and green but the 2008 team flossed the steely-diamond pattern on the shoulder and kneepads in addition to a modern, black-yellow-green color-scheme. What are the current school colors? Green, black, white, yellow, grey, gold, and steel. At first, and in some circles even now, these changes were universally despised. But the added attention created by the consistent and controversial changes to Oregon’s uniforms generated the exposure Nike was looking for. When asked how they got interested in playing for Oregon, we heard top-recruit LeGarrette Blount (2008) answer, “The uniforms are awesome,” and Heisman Finalist LaMichael James (2010) declare, “I loved the uniforms.” By appealing to the athletic vanity of an impressionable generation, Knight instigated a pigskin renaissance at the University of Oregon. 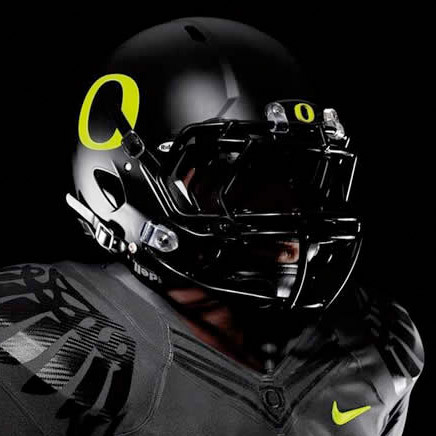 The current name for that revitalization is Nike Pro Combat, and when the Ducks take to the field in 2012, expect them to be leading the proverbial charge once again. Tyler is a University of Utah Alumni and is a dedicated Utes Fan. He enjoys watching any team from the PAC-12 play. He is also a writer for USCharterService.com. I’m not that impressed by their uniforms. Oh wow, they added duck wings and that steel print you see on truck-bed tool boxes. It’s nauseating how Oregon lets their sugar daddy Nike pimp the football team to develop new products and further their corporate interests. Oregon should change their mascot from the Ducks to the Nikes. I agree with Brandon, yet I don’t. 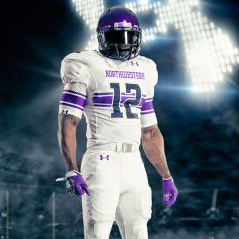 I think they have gotten just absolutely ridiculous with the revolving door unis from week to week. Yet some of them are actually well designed and cool. Most UO alums I speak to (and I work with many of them) loathe the uni changes and think it makes the University a joke. One even mentioned to me “Can they JUST ONCE wear their green and yellow helmets in a Bowl game?”. As someone that is into uniforms and is a professional artist, I like the concept of what they are doing in Eugene. Yet if I were a fan I would be unquestionably annoyed. Admittedly they are a fun team to pick in NCAA 12 because you never get bored picking your look from week to week.